Are you a merciful person? I don't mean how you see yourself, but I mean what you do. Merciful means compassionate and kind. Have you thought about kindness? God is kind to us and we are kind to others. The Bible says that God's kindness is what gets people saved. I became acquainted with 'the kindness guy', Steve Sjogren, a number of years ago. Steve has a couple of books all about God's kindness. I will never forget when my friend Mike and I knocked on doors of businesses, on Valentine's Day, and gave flowers to ladies, in Jesus name. Years ago, I also learned about how God heals people because of his mercy and compassion. In Matthew nine, there is a story of the two blind men, who call out to Jesus, "Have mercy on us, Son of David!" (9:27) And that is the mercy that Matthew has in mind, when he writes down, what Jesus spoke in his beatitudes. How satisfied you are when you demonstrate tender mercy! For tender mercy will be demonstrated unto you. The beatitudes are given in a particular order. The happiness of a person who shows others mercy follows on the heels of that person's experience of craving righteousness and justice fulfilled by God. It starts with a personal reckoning that I am hopeless and utterly impoverished without God. Personal poverty and hopelessness is the soil from which the life of kingdom of heaven can grow in me. It is a blessing and I am highly fortunate, if I become aware of this about my self. The message to me, in personal poverty and hopelessness is, "You are now blessed, because the kingdom of heaven is yours." The blessed person who sees themselves as poor and hopeless outside of God begins a life of mourning, that is paradoxically also a happy life. We continually mourn, but we are continually made happy. Christ's followers are happy mourners. This life of walking with God and following Christ teaches us or trains us to be humble. Our pride is shifted off of our selves and on to God. Personal pride just does not work or grow out of an authentic walk with God and a life desiring to follow Christ. When we follow Christ, our whole life shifts towards God being great, rather than our selves. But this does not mean that we take on or walk in low self-esteem or being like a worm. It means that I begin to esteem myself through God's eyes: "He loves me and God has an inheritance for me that I will offer back to God, The King." Then, from the living space of humbly walking with God and receiving an inheritance to give back to the king, believers develop and cultivate a craving for the righteousness and justice of God. This has nothing to do with and is diametrically opposed to self-righteousness or works-righteousness. The basis for the craving for righteous and justice from God, is a broken, hopeless heart, that grieves and mourns, and is humble. That person becomes a demonstrator of mercy. They live from mercy and practice mercy with those they meet. The person who has been through the process that I described has seen the kindness of God and become a kind person. God is kind. When we experience God, we experience his kindness. It is not a one time event, but a relationship. Is God the kindest person you have ever met? When we experience his kindness, we become kind people: mercy people. We have been shown mercy and become demonstrators of mercy, in our lives. In Matthew 18:21-35, Jesus tells a story to illustrate that we ought to demonstrate mercy to others because mercy has been given so greatly to us. Jesus illustrates how we ought to forgive not seven times, but seventy times seven. The hard word in the story is, that if we refuse to demonstrate mercy on others, then we forfeit the benefit of God's mercy in our own lives and become tortured in the prison of insanely trying to pay God for our own sins. Mercy comes from the inside out. Mercifulness is reciprocal in that we will not receive it if we do not demonstrate it. Mercy or kindness, like humility, is a disposition that is a state of being, brought on through encountering God in Christ. The attitude or the measure of our lives becomes mercifulness or kindness. Jesus creates character in us first that will act right later. Christianity is about Christ being in my life and living God's life. It is not something I do, but is something I am being. Having Christ is the first thing and how I act and live comes out of my being in Christ. I do not take Christianity and master it or make it work for me. Christianity is where I become controlled and animated, driven or compelled by Christ in me. To be a Christian is not just to take up Christ's teachings and live them out, but to take my whole life and give it to Christ to live out. Christianity that leaves this out, where the man or the woman seeks to follow Christ and his teachings, but never surrenders their whole lives, dying while living, taking up their crosses; is something other than Christian. Being a mercy person is something you are. How you treat others in the smallest settings is always the test of your Christlikeness. To find yourself as having become and now being a mercy person is a blessed and highly fortunate place, says Jesus. He says that when you are kind to others, you release kindness from others upon you. What is mercy? Mercy is different than love, peace, or grace. Mercy sees misery and wants to relieve it. Mercy wants to relieve suffering. Mercy is when someone is suffering, in misery, and you desire to, you want to and you do something to help them. Mercy is also when someone who has been your foe, who has opposed you, has been rendered powerless or is out of ammunition or sustenance, surrounded or cornered; and rather than destroy them, you have mercy on them. We always have a merciful stance towards God. We are in need of mercy and we go about receiving it. At the same time, we have been transformed into mercy people who are kind. 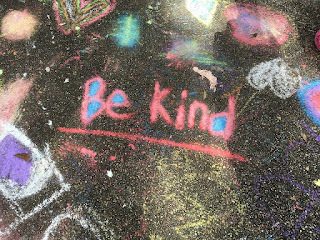 Kindness is our calling card, what people notice and remember about us; what people experience when we come into contact with them. Jesus people are mercy people. Christ-followers are merciful. To be a Christian is to be kind.